Save up to $1800 with selected Yamaha Four-Strokes up to 90HP! Save $20 per horsepower from the F2.5-F90. Hurry only while stocks last! This offer wont last forever! Now is the perfect time to buy! 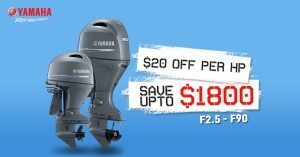 Disclaimer: $20 / horsepower promotion available from 4/02/2019 to 19/04/2019 on all newly purchased F2.5 – F90 four-stroke outboards from all participating Yamaha dealers. Savings are based on current RRP and subject to change without notice. Available to Private Buyers only on specified models purchased during the promotional period. Cannot be used with any other offer. Terms and Conditions apply. While stocks last. How to Flush Your Outboard! Gold Coast Boating Centre sells Yamaha outboards. We also have a range of Horizon, Formosa, Stessl and Stessco boats with many styles ranging from family boats, to fishing boats! Anyone looking to purchase a Quintrex, Stacer, Savage, Clark or a Seajay boat should really look at our brands for better value for money. We also service all brands of outboard motors. So if you need an outboard service, we are your one-stop shop! Simply call us to book in your preferred time!